Do you have difficulty going up and down the stairs? The stair chair professionals at Accredited Home Elevator have the solution for you. Stair lifts can help you regain independence by providing full access to all the floors of your home. Our stair chairs have the smoothest ride in the industry. They are quiet, safe, and durable. Our dedicated stair chair and lift professionals can deliver customized solutions in as little as a few days. Installations are quick and easy. If you are looking for a stair chair company with speedy delivery, unbeatable pricing and unrivaled customer service, look no further - you’ve found us at Accredited Home Elevator Company. Electra-Ride LT delivers safety, performance, and ease-of-use at an economy price. A home stair lift with features usually associated with top-of-the-line models, our Electra-Ride LT (SRE-2750) keeps stair lift prices in line and on track. Going upstairs and down has never been so effortless and inexpensive. Call it a stair lift, a chair lift, or a stair elevator, the Bruno Electra-Ride II has delivered powerful, dependable performance in the home for years. The Outdoor Electra-Ride Elite is the leader among chair lifts for outside applications. An outdoor stair lift with many standard features, it's remarkable. Every custom curved stair lift is crafted to exact specifications of your stairway. Bruno curved stair lifts provide access while adding to your home's character. Curved staircases are an attractive and prominent part of your home, don't allow them to compromise your accessibility. A home stairlift with features usually associated with top-of-the-line models, the Elan (SRE-3000) keeps stair lift prices in line and on track. Going upstairs and down has never been so effortless and inexpensive. Acorn 120 stair lifts are designed for straight staircases. The slim design allows for minimal obstruction on the stairs, allowing others to use the staircase freely when the stair lift is folded. Acorn stair lifts will blend into your home, and the smooth starting and stopping allows you to glide effortlessly up and down the stairs without any discomfort. 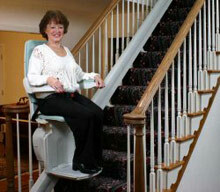 Years of research have gone into making the Acorn Stairlift one of the safest stair chairs available today. The Acorn 80 stair chair lift is designed for more complex staircases. With a wrap-around feature at the bottom of your stairs, the Acorn 80 stair chair can tuck away, allowing others to use the staircase while keeping the chair cleanly out of the way. The Acorn 80 stair lift even has the ability to travel down a hallway, allowing a shorter transfer distance between the stair lift and your bedroom or restroom. For users who require a stair lift outside their home, Acorn can provide a fully weather-proof stair lift ideal for outdoor use. With many of the same features and options as the popular Acorn 120 straight stair lift, the Acorn outdoor model comes supplied with a durable waterproof cover for extra protection. Unlike other accessibility equipment, stair chairs are often easy and quick to install and usually take only a day. They can be added to existing staircases and can be removed when no longer needed. We offer a range of lifts including straight, curved and outdoor chairs. Stair chairs are an affordable way to solve the obstacle of climbing up and down stairs and allow individuals to remain living in the home they are accustomed to. Whether the individual be handicapped or approaching their elder years, our stair chairs will keep them safe from injury caused by slipping or falling down the stairs. They require minimal maintenance and plug into a standard outlet. Finally, they come equipped with a battery, therefore allowing usage of the chair even if the power goes out. We install and service stair chairs throughout New Jersey, including Ocean County, Monmouth County, Atlantic County, Cape May County, Middlesex County, Burlington County, Union County, Philadelphia, PA and Staten Island, NY. We are located in South Jersey. Thinking about installing a stair lift yourself?